Today is a pretty exciting day for me because I am celebrating two big accomplishments. Today marks my 100th blog post and one year as a full time associate! Both seem crazy to me that they are already here. How have I already been blogging long enough for today to be my 100th post? How have I been out of college long enough for today to be my one year working at my first real job? Today, I'm talking about things I've learned over the course of each. 1. Work is way more enjoyable when you like the people you work with. Above is a picture of a group of girls who I interned with the summer before my senior year of college. Obviously your first priority at work should be to work. However, the day goes by much faster if you have someone to chat with, email fun links to, and meet up with for lunch! I'm lucky enough to have interned for my current job with some pretty amazing people and to work with great people now. Can you imagine how boring work would be if you didn't have a single person to talk to?! 2. Be on time and don't skip out of work early. I think this "rule" definitely loosens up the longer you've been with a company, but in your first year you most likely haven't earned the right to work 9:00-4:30 each day. Yes, there are days when we all are running behind or need to leave early. Just don't make it a habit. My manager said something one day that stuck with me: "I want to impress my boss so I want to be here before her and later than her each day." This is not honestly always possible for me, but I do make sure to be to my desk on time and to stay until five. (Okay 4:50 because I want to beat traffic ;)).I never thought this is something other people noticed, but as soon as he mentioned it I started noticing it, too. 3. "Your attitude, not your aptitude, will determine your altitude." Zig Ziglar (and my high school marketing teacher) knew what he was talking about with this quote. Your attitude is more important than your skill set. Anybody can be trained to do anything. If they actually want to do it is another story. A hard working person, who is still learning, is of greater value to a company than a person who is rude, smug, or lazy but very smart. Consider the two... who would you rather work with? 1. It takes way more time than you think. When I first started this blog, I was expecting it to take maybe an hour or two out of each day. (Ha!) I could honestly spend 8 hours a day brainstorming ideas, taking pictures, writing blog posts, networking, etc. It's not exactly possible with a full time job, though! I think I do a pretty good job of managing my time and making sure I'm not constantly staring at a computer screen, but I feel like I could always do more! 2. You need to be present in the blogging community. No matter how much we all wish it could happen, readers do not just magically find your blog. If you want people to know you have a blog, you need to promote yourself and comment on other blogs to get your name/face out there. Also, if people are taking the time to come to your blog, have the courtesy to respond to their comments either on your own blog or on theirs. Someone is taking time out of their day to read and comment on your blog. They won't keep that up if they never hear back from you! 3. There is always, always something to learn. I knew that blogging would be something new to learn, but I was not expecting to feel behind in my learning! I feel pretty tech-savvy, but the amount of time it took for me to figure out how to install a "Pin It!" button on my blog was embarrassing. Now I'm looking into growing my blog and the things I want to do are overwhelming to say the least. I have learned a lot from the book, Blog Inc., but after reading it I have a huge list of things to do and learn! In addition to this, don't be afraid to reach out to other bloggers you look up to. If you have a question, someone out there can answer it! I have reached out to some of my favorites in the past with questions and all have responded! Use your resources ;). Congratulations, Emily! Check your inbox later today for more information! Thank you all for reading this super text heavy post. I promise to be back with outfits on Monday ;). one year and one hundreth. The weather here has been so cold, but we haven't had any snow! Honestly, I don't even know the last time we had snow. I have mixed feelings about it. If it's going to be 12 degrees outside, there might as well be snow on the ground. Snow is pretty to look at but causes so many problems! However, I wouldn't mind some snow so I had another excuse to wear my new red hunters ;). Also! Today is the last day to enter the Brina Box giveaway. Cobalt blue is one of those colors that I think just goes with every other color. Last week, I wore a cobalt pencil skirt with a pink shirt. This week, I am wearing a cobalt top with a green pencil skirt. It pairs great with both! Rosegal sent me this shirt to style and when I received it I was so excited to wear it I didn't even think about needing to iron it after it was in the mail. I didn't even notice the creases until I was editing the pictures. (New blogger fail.) Next time I will look a little closer before wearing a brand new top! If you like the top I'm wearing today, but don't want it in blue, it comes in five other colors (and it's on sale!). You can order it here. This is my perfect outfit for a lazy Saturday. If I have to change out of my yoga pants to go run errands, an over sized sweater and converse are my go-to options. I especially like wearing Converse when we go shopping in the winter because having to take boots off to try on clothes gets old real fast! It was actually nice out this weekend, so I was able to go run errands and leave my coat in the car. It's the little things ;). I hope you guys had a good weekend! We had a very full weekend. Tyler and I went out to dinner Friday with Luke and Kelsey and Mary-Katherine and Matt! It's restaurant week here in KC, so the restaurant we were at had an amazing special. 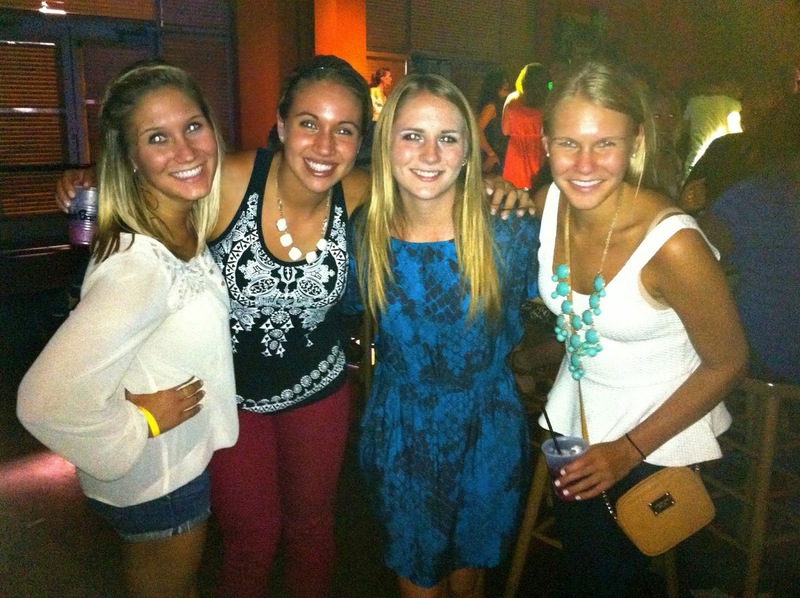 Saturday, we went out to celebrate two of my sorority sisters' birthdays! We went to the piano bar, which we went to for my birthday a couple weeks earlier. It is becoming a group favorite! If you missed Friday's post be sure to check it out here, so you can enter to win a product from Brina Box. Linking up with On The Daily Express and More Pieces of Me for Manic Monday! If you've been following along for awhile you've probably noticed that I wear a lot of products from Brina Box. I discovered the store on Instagram awhile back and instantly fell in love with their products. Their products are amazing quality for the price. I always worry about ordering jewelry online; you never know if it will break while shipping to you. I've never had that problem with any of my pieces before and months later they still are amazing quality. (It also seems like if you ever do have a problem they take care of it right away!) I pretty much want to own everything on their website. Here are some of my favorite looks featuring Brina Box's products! Want some Brina Box products for yourself? Well you're in luck! In honor of my upcoming 100th blog post, Brina Box is giving away one of their products to one of my readers! 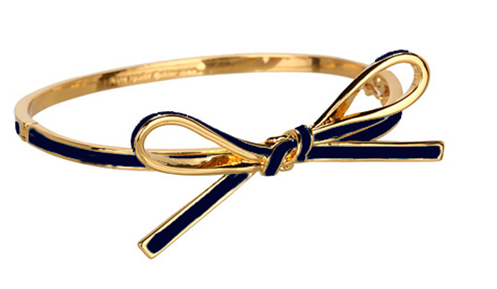 They are offering to give away one of their most coveted products; a navy bow bracelet! 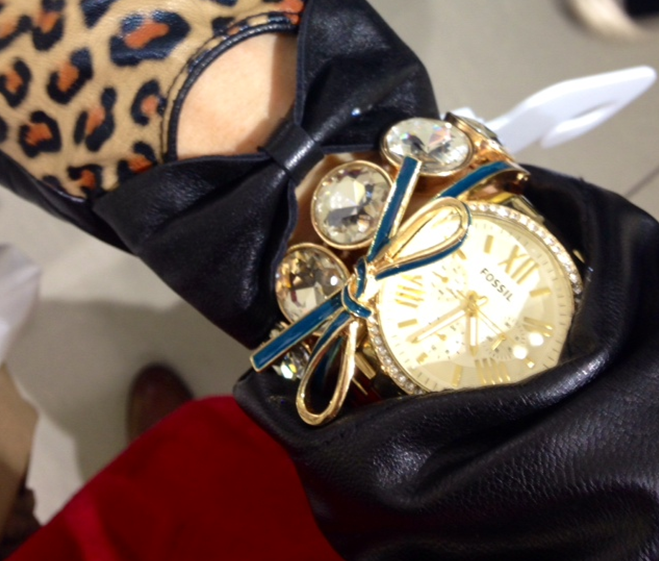 I think this bracelet would be the perfect addition to any arm party. I love how Brina Box styled in here. If you want to win this for yourself, fill out the Rafflecopter below! The winner will be announced on my 100th blog post on January 31st! Click here to see every look I've posted with a product from Brina Box. When I received an email from J.Crew factory advertising this print in both a top and bottom, I knew one would soon be joining my wardrobe. With the polar vortex happening, it seemed crazy to purchase shorts so I went with the top. One of my fashion goals has been to add more color and pattern into my wardrobe. Check and check. I have a phone call tonight with a possible wedding caterer. Our next decision to make is catering and then we will move on to our photographer. A blog post will be up soon highlighting our hunt for the perfect venue! In case you missed it, you can read about how Tyler proposed here. Come back tomorrow for a super fun giveaway ;). Today I am linking up with Shannon of Upbeat Soles and Tori of Fashion Bling and Other Girly Things to show you how we wear plaid! I think it is so fun how without even talking about it, we all styled completely different pieces. 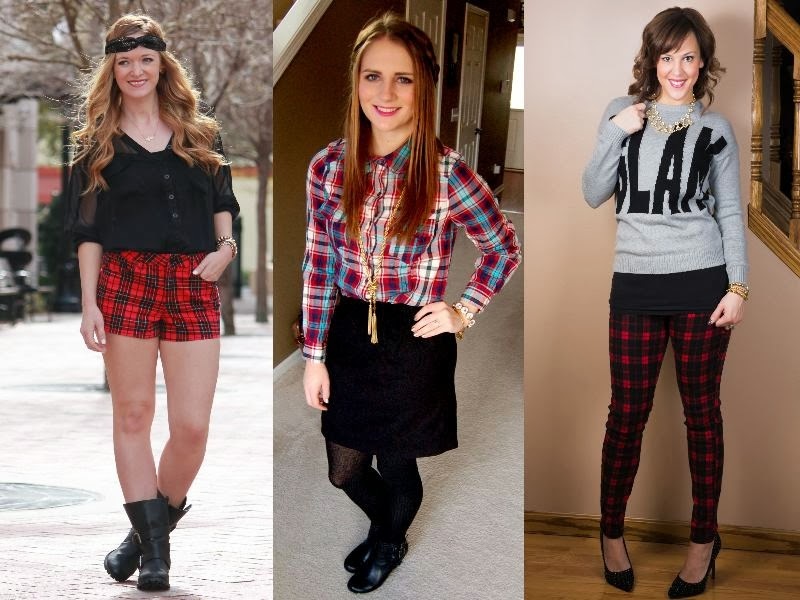 Plaid is a trend but you aren't limited to just one way, or one item, of wearing it! Be sure to stop by Shannon and Tori's blogs to check out their looks! On Instagram last week, I posted about my birthday gift to myself: Red Hunter Rain Boots! I purchased black ones last year and was worried about getting my money's worth out of them. Well, I wear them so often that I thought another pair was necessary. Now if someone could just tell the Kansas City weather to give me a lil' rain that would be fab ;). If you've been debating on buying them, you need to take the plunge. You will wear them more than you think. Two colors are actually on sale at Zappos right now! Click here to see if your size is available for less that $100! If you have been following along for awhile, then you know that my dress code at work is pretty laid back. I only have to look business casual when I am working with clients. Day to day, I am able to wear jeans. I have been receiving emails lately asking what I would wear to work if I had to dress up. I have been replying directly, but the emails have become so common lately I thought I would share my thoughts with the rest of you! I recently discovered the shop Persunmall have been very impressed with their selection of clothing. (I could seriously spend hundreds of dollars there right now!) Everything featured today is from their shop! The key to dressing for work is to choose structured pieces. A blazer is a no-brainer for the office, but a fun colored one makes it more exciting. If a pink blazer isn't your style, I love this one. It is tweed with leather detailing and is so on trend right now! I also really love this jacket, and the price cannot be beat! If you're more of a skirt person, the below look is for you. A pencil skirt is the usual skirt people reach for in the office place. I'm a huge fun of them, but why not try to switch it up!? A skater skirt or a midi skirt can be just as appropriate. A collared shirt is also an office necessity, but pick one in a fun pattern to make it more personal. Not a fan of hearts? Try this polka dot one or this beige one instead! I hope you all had a fabulous weekend!! There are fun collaborations and giveaways happening this week so be sure to check back! Woohoo, it's Friday!! I am so excited for this weekend because I have zero plans. Since Thanksgiving, Tyler and I have been in town for a total of 2 weekends. It has been fun, but I am excited to relax. I am looking forward to doing absolutely nothing all weekend! Remember when I told you all a couple months ago about how the guys I work with like to pick fun at the clothes I wear? Well, I was expecting some of the guys to make some jokes about the fur vest when I wore it this week. In reality, three of them complimented it! Have I made them start embracing fashion more? Probably not... but I consider it a win ;). Congratulations, Pamela! Erin Condren will be emailing you a coupon code to use for your order soon! If you do not hear from them by the end of the weekend, please reach out and let me know! Thanks again to Erin Condren and everyone who entered! Erin Condren Review + Giveaway!